Step into the light and into my New York Christmas Tour! Don’t be scared! I promise, festivity awaits, and very possibly a dog or two. Seriously guys, I do love Christmas. I start watching cheesy Christmas movies around Thanksgiving and soon after that I’m playing Christmas music in my apartment 24-7. Today’s Christmas tunes and classic ones. No lie! Mommy’s Kissing Santa Claus right now on my Pandora radio. As you may know from my book review post, I read A New York Christmas by Anne Perry. If you didn’t read it, don’t fret! You can find it here to learn more about the book. For a short recap, our heroine, Jemima, accompanies her friend Delphinia (or Phinnie for short) across the Atlantic from London to New York City. Phinnie is set to marry into the very wealthy Albright family. Phinnie’s mom, Maria, abandoned her as a child and Maria’s whereabouts are unknown, although the groom’s brother, Harley, believes she could be in NYC. He’s worried she will show up to the wedding and ruin it. So he enlists Jemima’s help to find Phinnie’s mom in order to prevent that disaster from happening. Jemima gets in deep and finds herself in a pickle! Katherine has been following my blog for quite a while now and has even read a few of the books along with me. I’m still in disbelief that someone out there is reading along with me. That’s so cool! What’s even cooler is that she got her mom to read along with me too! I love it! Katherine and her mom Jane are originally from New York and do an annual trip, so I got to hang out with them both for this tour. I definitely enjoyed meeting them. Sadly for them, I may be more entertaining via the written word than in person. I am slow-to-warm-up to new people. Been that way since I was a shy girl in grade school making friends by staring at them for months until they realized I was not half-bad and then we became bonded for life. Katherine has her own blog that you should check out. It’s filled with sweet, “useless” horses (her words) and cute cats too! Also, photography, graphic design, and whatever the hell else she feels like writing about: The Virtual Brush Box at Rodneyssaga.com. When we were in the planning process for this tour, we all agreed that the wealthy but fictional Albright family must have been inspired by the wealthy and very real Vanderbilt family. We gathered by Jemima’s path to the Albright mansion that they resided on 5th Avenue. You know who else lived on 5th Avenue? Yup, you guessed it! The Vanderbilts! For more info on the Vanderbilts and their mansions on 5th Avenue, you can go here. Cornelius Vanderbilt II had a mansion where Bergdoff Goodman currently is. So first stop on our tour is the Albright Mansion…ie Vanderbilt’s mansion…ie Bergdorf Goodman. Fifth Avenue also happens to have a few stores decked out for Christmas. A trip to NYC during Christmas time would not be complete without visiting some festive Christmas windows. We stayed along 5th Avenue and walked to Tiffany’s. I had to go there again, not only to see their display but also because it’s a throwback back to my first ever book tour, my Breakfast at Tiffany’s tour. Tiffany’s will always hold a special place in my heart. The book, as you know, is set in 1904 and while we couldn’t exactly time travel, we got a little crafty imagining what our characters would have seen in that time period. Did you know that the Cartier building was constructed in 1904? We didn’t either until we went on this tour! I am sure our characters, Jemima, Phinnie, Miss Celia Albright, and maybe even Harley, walked past this building. We’re time traveling now! After finishing up with Christmas windows, we, of course, had to do another quintessential NYC Christmas-time activity, which you’d think would be to see the famous Rockefeller Center’s tree, but I’m not a big fan of crowds and I’ve seen it a few times. I’m sure you have too, if not in person, but in pictures and maybe even a Christmas special or two? With the help from this post, I learned of another tree that would be in our tour area. I have another awesome blogger to tell you about. When I was on good ol’ Twitter, I saw Mary Lane from New York Cliche post a lovely picture of herself in an awesome red coat in front of a NYC Christmas tree. It’s an awesome picture and when you go to her blog here, you can see it for yourself! I complimented her coat and she was so nice to tell me about Poshmark where I ended up purchasing my very own festive red coat. Mary also pointed out how environmentally friendly purchasing from Poshmark is since their clothing is used. My coat came in perfect condition! I’m very happy with my purchase and I definitely will be purchasing more stuff from that site in the future. You guys, I seriously did not realize until after I looked at my pictures that we went to the same tree! So not only did I get a red coat because of her’s, I posed in front of the same tree! Omg! You know what they say…”Imitation is the sincerest form of flattery.” Right? Thank you, Mary Lane, for the inspiration! Don’t forget to check out her blog. Her Christmas window pictures put mine to shame! I will be better next year! Also, thank you, Katherine, for getting this shot. Katherine, being the great photographer that she is, framed this perfectly. Katherine’s mom was also smiling at me so it helped me smile genuinely. Thank you, Jane! Visiting this tree was pretty nice. The location is picturesque and there are for sure a lot fewer people than at Rockefeller. Even so, a group was gathered here, so you do have to wait your turn to snap that picture-perfect shot. Do you guys like my gloves? They were purchased because instead of packing my black gloves in my pocket, I packed a pair of rolled up black socks. Seriously. NY street gloves, what a New York cliché, right Mary? This is the 3rd time I’ve made a street purchase during my book tours, so now I’m gonna make it a new tradition. Remember my street sunglasses from my I Heart New York tour? And my magnets from my New York, Actually tour? The glasses were $5 and they are broken now and one of my magnets has come undone a bit, but what can ya do? I will cherish my street purchases for as long as they are in my life. I’m looking forward to my next street find! Anyway, where’s Cassie? Remember my friend who was supposed to join us? She was supposed to meet us at 2pm. What rink am I texting of, you ask? Let’s get back to the story in A New York Christmas. Harley has just enlisted Jemima’s help in finding Phinnie’s mother, Maria. He believes that since Maria likes freshly fallen snow (who doesn’t?) and parks, that they will have a good chance of finding her in Central Park. Oh yes, he’s aware of how big Central Park is but he knows the best spots to see the snow after it falls perfectly on the trees and he believes Maria would know the best spots too. That’s good enough information for me too! It wasn’t snowing but if it was snowing, this might be a good spot to find Maria. I think Maria’s up there. She’s gotta be! I think I’ve now narrowed it down to 5 possible Marias. Not too shabby! When Harley talked about bringing Jemima to Central Park, Mr. Albright, not being aware of their intentions, enthusiastically suggested that they go to the ice skating rink. They didn’t actually do that, but that was enough to inspire us to go and we were glad we did! We thought he was just a random guy skating but when he finished, the announcer said it was Brian Boitano! We were in disbelief, so much so, that we didn’t really believe it until Katherine emailed the online proof that he skated in Central Park. I grew up watching figure skating during the Olympics, so it impressed me! I have video of him skating that I will share on my Instagram story highlights. 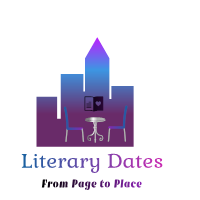 Make sure you’re following me @literary_dates. Katherine asked if we were going to skate, which is a logical question to ask when you arrive at an ice skating rink. I apprehensively said, “Sure!” We both changed our minds when we saw the crowd form. She expressed hesitation first and I thought, “Oh thank god!” I’m seriously a nervous person. Haven’t skated in ages, can only stop by slamming into a wall, and my stomach was feeling not quite right. I also don’t trust my balance anymore. As I’ve gotten older, I’ve needed max encouragement to do stuff. In the summers, when we go swimming in the cold lake, my whole family will have jumped in and I stand at the edge of the dock or boat for eons bracing myself. My 78-year-old mother is in the water rolling her eyes at me. I used to be a little more adventurous…um…I’ve gone paragliding, canyoning, repelling, a short zip line, as a kid I went up in a tiny airplane (I’d never do that again). I don’t know what happened to me either! What do you think, should I have laced up those skates? Should I be more adventurous? I bet, had I not jumped on Katherine’s slight hesitation, she might have done it. Maybe? Anyways, let me know in the comments if I should be more daring. We closed out our Central Park adventure by hearing some sweet Christmas tunes from this sax player. I’ll have a video from him in my Instagram story highlights! But wait a second…where’s Cassie? Let’s check in again, shall we? I might have made a mistake with this one. I assumed Jemima and Harley went from the park to Hell’s Kitchen, the neighborhood they thought Maria lived in. The book never identifies the neighborhood they went to. It seemed like from what I read that they walked and Hell’s Kitchen is walking distance from the park. Harley also talked about the area as being improper for Jemima. It sounded like a sketchy area, which Hell’s Kitchen was back then. However, upon a second look at the book before writing this post (not before going on the tour-oops), the word “eastward” was used while they were walking out of the park. Maybe they went east for a bit before heading west? I’m going with that! The book summary says they go to Hell’s Kitchen so that’s where we go! Right or wrong? Who knows? We wanted to time travel again so we went to a place that originally opened in 1868. Awww Patrick…I won’t say any more about Patrick. My lips are sealed. 626 11th Ave. at 46th St.
Time to get food in our bellies! I had a goat cheese vegetable wrap, which was pretty decent. Goat cheese has a wonderful ability to transform otherwise bland meals, right? I was happy I didn’t have to choose between fries and a salad. I don’t like making decisions! The fries were a bit soggy, but that’s okay, I didn’t need those extra calories. Katherine and her mom got the fish & chips, which they both approved of. Where the heck is Cassie!?! All these texts were posted with Cassie’s consent because she’s impressed by her sleeping abilities and wants the world to know about it. In Cassie’s defense, she’s juggling a lot right now. Just moved back to the city, started a new job, is couch surfing, and apartment hunting! I couldn’t handle that! At the end of our meal, we said goodbye to Jane who heads back to her hotel. Katherine and I go to our final spot in Little Italy because Jemima and Harley meet up there at the beginning of the story. That’s when he proposes that they team up to find Maria. Did I mention that this tour happened to fall on Santacon? It’s NYC’s annual tradition where young “kids” dress up as Santa, do a bar crawl and get plastered beyond belief. Once I watched a sad “Santa,” alone at the end of the night, on the train, eating a very greasy pizza slice without any napkins. I watched in horror as his grease-covered fingers searched for a way to degreasify. The fingers settled on the paper sack the pizza came in. Ick. By day this guy is probably a high-powered lawyer…on Santacon, he’s a reindeer. Sorry, he’s not a Santacon Santa, but I wouldn’t have been surprised if he was. You see? They invade our subways. In retrospect, I should have walked down the block to get the “Welcome to Little Italy” sign from the right side. Ah! We took our treats to go, so Katherine could get back to her warm hotel and as for me? Well…I accidentally left my kindle at the Landmark Tavern. Yeah, that really happened. I said a fond farewell to Katherine and just considered that, for me, the tour was still going. I had to go all the way from Little Italy all the way back to the other side of the planet on 11th Avenue in Hell’s Kitchen. I finally make it back to the tavern and retrieve my kindle! I did say I wanted to time travel back in time, didn’t I? I’m so lucky the Landmark Tavern kept it safe! Did I call their French fries soggy? I take it back! They were delicious! Who doesn’t love soggy fries? I could have had 10 more of those mini cannolis and five more cream puffs. The eclair was just okay but I was seriously wishing I got more of the other ones. This, along with my cheesy Christmas movie, “Christmas Wedding Planner,” was the perfect way to end the night. But the perfect way to end this post is with some dogs of course! My montage of blurry pups! Once a dogstalker, always a dogstalker! Thank you all for reading! You are seriously the best! If you decide to give this book a whirl, just remember that it’s very short and might seem a little rushed. All in all, I thought it was a fun, light read! Thank you to author Anne Perry for the inspiration for my first New York Christmas book tour! To everyone, I hope you enjoy your holidays! Have a Happy New Year! Let’s all put our best foot forward in ‘19. I’m seriously gonna try! I mean, I’m gonna do it! I will be in touch soon with what I have planned for January. Stay tuned. Don’t forget to check out Katherine’s blog at rodneyssaga.com. Also, don’t forget I will be posting videos from my tour in my Instagram story highlights, so don’t forget to follow me @literary_dates. Okay, I can SO related to taking a while to warm up to new people. That’s me 100%. And taking forever to dive into water? That’s me too! We’re twins or soul mates or something LOL! I think it’s hilarious that your friend slept through the whole thing, then texted about it bahaha! And OMG your kindle! Thank goodness the restaurant found it and held onto it for you! Oh my golly, those cannolis look heavenly! Cannolis are my favorite…I always want one! Holy cow that Santacon with all the random costumes–crazy, but very festive, love it! This book sounds super sweet! The perfect fun Christmas read! I’ve heard so many good things about this author’s book, I need to read this one! Way to go, Lauren! Freaking awesome book tour as usual! Love all the book stuff and random NYC happenings you capture 🙂 Super excited for the next one! Thank you thank you!!! I’m so glad you liked it! You are awesome. I so appreciate your support and encouragement! Hahaha! Oh my god I think you’re right! We’re twin soulmates! 😍 I’m glad I’m not the only one like that. Haha! Yup, she was quite a sleeper! Those cannolis were delicious!! I want more! Haha oh boy those Santacons…I’ve never participated in that and now I definitely would be too old to. What a gorgeous and fun tour around NYC! 1) The pic of you glowing in front of that Christmas tree. What a beautiful setting! I think that’s also where they filmed some scenes of Gossip Girl. Loved that you went there. I would love to see that someday. Too bad for the lines. I’d think the trick is super early in the morning. Maybe? 2) The skating rink! I have so many memories there. My mom would us all the time when were were kids. Miss it so much. You should have totally skated. Screw the crowds and looking silly. That’s part of the fun. It’s okay though, I forgive you. Places to go. People to see. 3) OMG, Cassie! I almost spit out my coffee when you said “typical New Yorker” cause I was thinking the same thing. Hilarious! I’m impressed by her sleeping abilities too! Sometimes stress does that to you and you just need to catch up on that rest. You guys can do your own sightseeing on another day. 4) Touristy or not, I LOVE little Italy. And Ferrara’s cannolis are such a treat. It’s been years for me. Wonderful post and pics! On my bucket list is to do Christmas In NYC again one year but that’s gonna be far into the future right now. Gonna check you out on IG! I know! It was the hotel Serena lived in! I didn’t realize that until after my tour. You should definitely go! It wasn’t too bad. Just a small crowd around the tree and you just politely wait until a good moment to pose. It wasn’t like a formal line. But yeah I’m sure it would be pretty empty early in the morning. Next time I’ll try that! I know! I should have skated! I just felt nervous about it and had a wonky stomach. Maybe I should go back later!? That’s so awesome that your mom took you there all the time. What sweet memories! This was the first time I’ve been to Ferrara’s! I loved those cannolis! They were so good. I wish that I had gotten more! Not that I needed all those calories. What a magnificent job you did with the this tour post! I was there and it was magical but your photos put such a great interpretation on everything we saw. I love the top one with the tree and the tunnel of light. Such an artist! I knew you ‘weren’t bad’ right away and I think we made a good team. It was fun looking at the places we saw for a reason, not just because they were there. It was especially fun because we had all read the same book so we had a common frame of reference. We were ‘on the same page’, if you will. I enjoyed our day and meeting you. Katherine and I will be back in 2019 and we hope to do another book tour with you. We’re thinking maybe November, a bit warmer than this tour. It was soooo cold! Will you have us again? Please? A thought: maybe others might enjoy doing a tour with you. We certainly did. Looking forward to our next tour but in the meantime, let’s read together. Wow, Jane! Your comment made my day! It seriously makes me feel so good. Thank you! I’m glad you liked how the post turned out. I’m also so glad you enjoyed the tour and you’re right, it was fun being on the same “page.” Pretty cool! And I know it was so cold! I think that was the coldest day we’ve had here so far. I would love to do another tour with you guys. Let’s wait a little longer to confirm though, haha, because who knows what will be going on at that time? I was totally thinking before we did the tour that others might want to as well. I thought maybe I should get a tour guide license but I don’t know I’d have to market myself as- Come Get Lost with Lauren because we will get lost. Don’t worry though, we’ll always eventually find our way. It was a great tour. Our hostess was as charming in person as she is online. Yeah, we probably should have gone skating. In our defense, the rink looked like the subway at rush hour. Ha! It really did look like the subway at rush hour. Now that you put it that way, I feel confident that we made the right decision. Thanks for reading my post on our tour! I had no idea that there was such a thing as a NYC tour guide license. Googled it. That’s quite a list of books to study. OTOH, Come Get Lost with Lauren is catchy. Whether you want to do any of this is another matter. Keep us posted! Yeah, I’d have to study hard! I don’t know if I’ll go that route yet. We’ll see what 2019 brings. Happy New Year! I could have sworn I posted a response to this months ago! Oh well, I am posting now! You went to dome of my fave areas and other places I never knew like the spot in front of the tree in your fab coat. I always take a distant photo in front of the Rock tree. Sorry for late response. Hope this one goes through. This is the best comment ever! Makes me feel so good! Thank you so much! I can’t believe your compliments. Thank you! I’m so glad you liked this post. I am trying to get better and better. I hope that will continue to happen!